In government, the village is the unit, and a genuinely democratic government it is. There is a house chief, a Kiva chief, a war chief, the speaker chief or town crier, and the chiefs of the clans who are likewise chiefs of the fraternities; all these making up a council which rules the pueblo, the crier publishing its decisions. Laws are traditional and unwritten. Hough says infractions are so few that it would be hard to say what the penalties are, probably ridicule and ostracism. Theft is almost unheard of, and the taking of life by force or law is unknown. To a visitor encamped at bedtime below the mesa, the experience of hearing the speaker chief or town crier for the first time is something long to be remembered. Out of the stillness of the desert night comes a voice from the house tops, and such a voice! From the heights above, it resounds in a sonorous long-drawn chant. Everyone listens breathlessly to the important message and it goes on and on. The writer recalls that when first she heard it, twenty years ago, she sat up in bed and rousing the camp, with stage whispers (afraid to speak aloud), demanded: "Do you hear that? What on earth can it mean? Surely something awful has happened!" On and on it went endlessly. (She has since been told that it is all repeated three times.) And not until morning was it learned that the long speech had been merely the announcement of a rabbit hunt for the next day. The oldest traditions of the Hopi tell of this speaker chief and his important utterances. He is a vocal bulletin board and the local newspaper, but his news is principally of a religious nature, such as the announcement of ceremonials. This usually occurs in the evening when all have gotten in from the fields or home from the day's journey, but occasionally announcements are made at other hours. "All people awake, open your eyes, arise,Become children of light, vigorous, active, sprightly:Hasten, Clouds, from the four world-quarters.Come, Snow, in plenty, that water may abound when summer appears.Come, Ice, and cover the fields, that after planting they may yield abundantly.Let all hearts be glad.The Wuwutchimtu will assemble in four days;They will encircle the villages, dancing and singing.Let the women be ready to pour water upon themThat moisture may come in plenty and all shall rejoice." As to the character of their government, Hewett says: "We can truthfully say that these surviving pueblo communities constitute the oldest existing republics. It must be remembered, however, that they were only vest-pocket editions. No two villages nor group of villages ever came under a common authority or formed a state. There is not the faintest tradition of a 'ruler' over the whole body of the Pueblos, nor an organization of the people of this vast territory under a common government." Making up the village are various clans. A clan comprises all the descendants of a traditional maternal ancestor. Children belong to the clan of the mother. (See Figure 1.) These clans bear the name of something in nature, often suggested by either a simple or a significant incident in the legendary history of the people during migration when off-shoots from older clans were formed into new clans. Thus a migration legend collected by Voth accounts for the name of the Bear Clan, the Bluebird Clan, the Spider Clan, and others. Sons and daughters are expected to marry outside the clan, and the son must live with his wife's people, so does nothing to perpetuate his own clan. The Hopi is monogamous. A daughter on marrying brings her husband to her home, later building the new home adjacent to that of her mother. Therefore many daughters born to a clan mean increase in population. 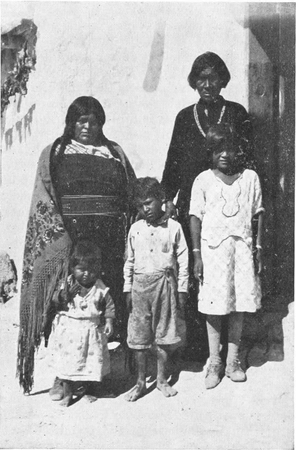 Figure 1.—Hopi Family at Shungopovi.—Photo by Lockett. Some clans have indeed become nearly extinct because of the lack of daughters, the sons having naturally gone to live with neighboring clans, or in some cases with neighboring tribes. As a result, some large houses are pointed out that have many unoccupied and even abandoned rooms—the clan is dying out. Possibly there may be a good many men of that clan living but they are not with or near their parents and grandparents. They are now a part of the clan into which they have married, and must live there, be it near or far. Why should they keep up such a practice when possibly the young man could do better, economically and otherwise, in his ancestral home and community? The answer is, "It has always been that way," and that seems to be reason enough for a Hopi. Land is really communal, apportioned to the several clans and by them apportioned to the various families, who enjoy its use and hand down such use to the daughters, while the son must look to his wife's share of her clan allotment for his future estate. In fact, it is a little doubtful whether he has any estate save his boots and saddle and whatever personal plunder he may accumulate, for the house is the property of the wife, as well as the crop after its harvest, and divorce at the pleasure of the wife is effective and absolute by the mere means of placing said boots and saddle, etc., outside the door and closing it. The husband may return to his mother's house, and if he insists upon staying, the village council will insist upon his departure. Again, why do they keep doing it this way? Again, "Because it has always been done this way." And it works very well. There is little divorce and little dissension in domestic life among the Hopi, in spite of Crane's half comical sympathy for men in this "woman-run" commonwealth. Bachelors are rare since only heads of families count in the body politic. An unmarried woman of marriageable age is unheard of. The Hopi woman's life is a busy one, the never finished grinding of corn by the use of the primitive metate and mano taking much time, and the universal woman's task of bearing and rearing children and providing meals and home comforts accounting for most of her day. She is the carrier of water, and since it must be borne on her back from the spring below the village mesa this is a burden indeed. She is, too, the builder of the house, though men willingly assist in any heavy labor when wanted. But why on earth should so kindly a people make woman the carrier of water and the mason of her home walls? Tradition! "It has always been this way." Her leisure is employed in visiting her neighbors, for the Hopi are a conspicuously sociable people, and in the making of baskets or pottery. One hears a great deal about Hopi pottery, but the pottery center in Hopiland is the village of Hano, on First Mesa, and the people are not Hopi but Tewas, whose origin shall presently be explained. Not until recent years has pottery been made elsewhere in Hopiland than at Hano. At present, however, Sichomovi, the Hopi village built so close to Hano that one scarce knows where one ends and the other begins, makes excellent pottery as does the Hopi settlement at the foot of the hill, Polacca. Undoubtedly this comes from the Tewa influence and in some cases from actual Tewa families who have come to live in the new locality. For instance, Grace, maker of excellent pottery, now living at Polacca, is a Tewa who lived in Hano twenty years ago, when the writer first knew her, and continued to live there until a couple of years ago. Nampeo, most famous potter in Hopiland, is an aged Tewa woman still living at Hano, in the first house at the head of the trail. Her ambitious study of the fragments of the pottery of the ancients, in the ruins of old Sikyatki, made her the master craftsman and developed a new standard for pottery-making in her little world. Mention was made previously of the women employing their leisure in the making of baskets or pottery. An interesting emphasis should be placed upon the "or," for no village does both. The women of the three villages mentioned at First Mesa as pottery villages make no baskets. The three villages on Second Mesa make a particular kind of coiled basket found nowhere else save in North Africa, and no pottery nor any other kind of basket. The villages of Third Mesa make colorful twined or wicker baskets and plaques, just the one kind and no pottery. They stick as closely to these lines as though their wares were protected by some tribal "patent right." Pottery for First Mesa, coiled baskets for Second Mesa, and wicker baskets for Third Mesa. The writer has known the Hopi a long time, and has asked them many times the reason for this. The villages are only a few miles apart, so the same raw materials are available to all. These friends merely laugh good naturedly and answer: "O, the only reason is, that it is just the way we have always done it." Natural conservatives, these Hopi, and yet not one of them but likes a bright new sauce-pan from the store for her cooking, and a good iron stove, for that matter, if she can afford it. There is no tradition against this, we are told. More than two centuries ago, these Tewas came from the Rio Grande region, by invitation of the Walpi, to help them defend this village (See Figure 2) from their Navajo, Apache, and Piute enemies. They were given a place on the mesa-top to build their village, at the head of the main trail, which it was their business to guard, and fields were allotted them in the valley below. They are a superior people, intelligent, friendly, reliable, and so closely resemble the Hopi that they can not be told apart. The two peoples have intermarried freely, and it is hard to think of the Tewas otherwise than as "one kind of Hopi." However, they are of a distinctly different linguistic stock, speaking a Tewa language brought from the Rio Grande, while the Hopi speak a dialect of the Shoshonean. "When the Hano first came, the Walpi said to them, 'Let us spit in your mouths and you will learn our tongue,' and to this the Hano consented. When the Hano came up and built on the mesa, they said to the Walpi, 'Let us spit in your mouths and you will learn our tongue,' but the Walpi would not listen to this, saying it would make them vomit. This is the reason why all the Hano can speak Hopi, and none of the Hopi can talk Hano." The work of the men must now be accounted for lest the impression be gained that the industry of the women leaves the males idle and carefree. It is but fair to the men to say that first of all they carry the community government on their shoulders, and the still more weighty affairs of religion. 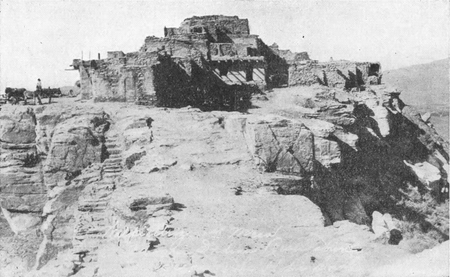 They are depended upon to keep the seasonal and other ceremonies going throughout the year, and the Hopi ceremonial calendar has its major event for each of the twelve months, for all of which elaborate preparation must be made, including the manufacture and repair of costumes and other paraphernalia and much practicing and rehearsing in the kivas. Someone has said much of the Hopi man's time is taken up with "getting ready for dances, having dances, and getting over dances." Yes, a big waste of time surely to you and me, but to the Hopi community—men, women, and children alike—absolutely essential to their well-being. There could be no health, happiness, prosperity, not even an assurance of crops without these ceremonies. The Hopi is a good dry farmer on a small scale, and farming is a laborious business in the shifting sands of Hopiland. Their corn is their literal bread of life and they usually keep one year's crop stored. These people have known utter famine and even starvation in the long ago, and their traditions have made them wise. The man tends the fields and flocks, makes mocassins, does the weaving of the community (mostly ceremonial garments) and usually brings in the wood for fuel, since it is far to seek in this land of scant vegetation, in fact literally miles away and getting farther every year, so that the man with team and wagon is fortunate indeed and the rest must pack their wood on burros. Both men and women gather backloads of faggots wherever such can be found in walking distance, and said distance is no mean measure, for these hardy little people have always been great walkers and great runners. Hough says: "Seemingly the men work harder making paraphernalia and costumes for the ceremonies than at anything else, but it should be remembered that in ancient days everything depended, in Hopi belief, on propitiating the deities. Still if we would pick the threads of religion from the warp and woof of Hopi life there apparently would not be much left. It must be recorded in the interests of truth, that Hopi men will work at days labor and give satisfaction except when a ceremony is about to take place at the pueblo, and duty to their religion interferes with steady employment much as fiestas do in the easy-going countries to the southward. Really the Hopi deserve great credit for their industry, frugality, and provident habits, and one must commend them because they do not shun work and because in fairness both men and women share in the labor for the common good."